One of our suppliers came to visit yesterday and brought a beautiful and tasty mooncake with him for the mid-Autumn festival. The mid-autumn festival is a harvest festival where the moon is celebrated. 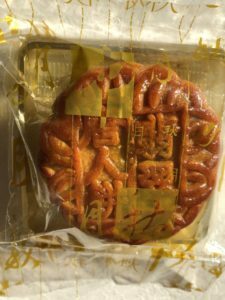 Eating mooncake during this time is the same as how you would eat turkey during Thanksgiving. Luckily, this one didn’t contain any eggs as we’re not a fan of those at the Feng Shui Store! Mooncake is given on the moon festival to family friends and business clients as a symbol of completeness and togetherness to compliment the new moon. Does anyone else like mooncake?